This article is about plant types. For other uses, see Evergreen (disambiguation). 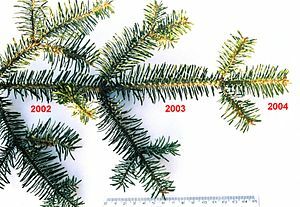 A silver fir shoot showing three successive years of retained leaves. Leaf persistence in evergreen plants varies from a few months to several decades (over thirty years in the Great Basin Bristlecone Pine). Deciduous trees shed their leaves, usually as an adaptation to a cold or dry/wet season. Evergreen trees do lose leaves, but each tree loses its leaves gradually and not all at once. Most tropical rainforest plants are considered to be evergreens, replacing their leaves gradually throughout the year as the leaves age and fall, whereas species growing in seasonally arid climates may be either evergreen or deciduous. Most warm temperate climate plants are also evergreen. In cool temperate climates, fewer plants are evergreen, with a predominance of conifers, as few evergreen broadleaf plants can tolerate severe cold below about −26 °C (−15 °F). In areas where there is a reason for being deciduous, e.g. a cold season or dry season, being evergreen is usually an adaptation to low nutrient levels. Deciduous trees lose nutrients whenever they lose their leaves. 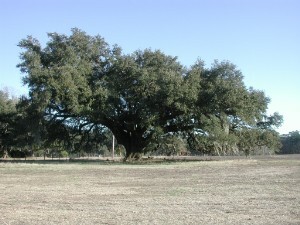 In warmer areas, species such as some pines and cypresses grow on poor soils and disturbed ground. In Rhododendron, a genus with many broadleaf evergreens, several species grow in mature forests but are usually found on highly acidic soil where the nutrients are less available to plants. In taiga or boreal forests, it is too cold for the organic matter in the soil to decay rapidly, so the nutrients in the soil are less easily available to plants, thus favouring evergreens. ^ Aerts, R. (1995). "The advantages of being evergreen". Trends in Ecology & Evolution 10 (10): 402–407. ^ Matyssek, R. (1986) "Carbon, water and nitrogen relations in evergreen and deciduous conifers". Tree Physiology 2: 177–187. ^ Sobrado, M. A. (1991) "Cost-Benefit Relationships in Deciduous and Evergreen Leaves of Tropical Dry Forest Species". Functional Ecology 5 (5): 608–616. Helen Ingersoll (1920). "Evergreens" . Encyclopedia Americana.